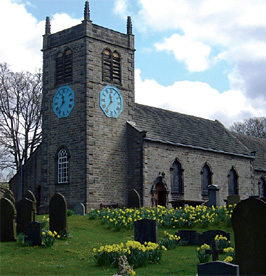 St Peter’s is an ancient and living church serving the village of Addingham. Christians have worshipped on this site for over 1100 years. The building, set amid an open field, has a nave roof, arcade and chancel dating from the 15th century with a gallery of 1756. It is a place of prayer, peace and beauty where you will find a warm welcome. To love God more deeply in our worship and through our friendship and support for all. To learn more about God and to share the message of love, forgiveness and justice which he offers to all through his Son Jesus Christ. To live our lives more fully in faith and in service. Please take a tour of the site. We hope you enjoy learning about our Church, and that you will come along and visit us. Our monthly magazine “Source” is also published online – read it here. For current weekly / monthly schedules and news don’t forget to have a look at “Church Diary“; “News” ; and “Newsflash” . (It’s worth following newsflash for the latest on discussion groups!). Please look in ‘Contacts’ for more details of who to get in touch with. Miserables, this year we will be exploring the themes raised by the film ‘The King’s Speech’.